A great KPI dashboard needs to do only one thing: let users make the best decisions. However, many businesspeople we work with also regularly present important data to the board, stakeholders, managers and colleagues. These people also need to make the best decisions they can from the data they are presented. Since they are both needed to do the same thing, does a great dashboard make a great presentation? Thinking about this logically, the answer is no, but a great dashboard is a great starting point for a killer presentation. This article will explain the differences between the two, and how to create a great presentation from a dashboard. At first glance, the obvious difference between dashboard and presentation is that while a dashboard is an organized collection of charts usually shown together, a presentation is usually given one or two charts at a time. This is because while KPI dashboards and presentations can be used to present the same information, they serve different purposes to users. Presentations – Used for emphasizing one aspect of data to viewers, or for conveying a single point within your data. In short: in a great presentation, the conclusions that users reach should be the same as those of the presentation’s creator. On the other hand, a well-designed dashboard allows users to experiment with their data and draw their own conclusions. So, if you’ve designed a great dashboard, can it be converted into a great presentation without spending a lot of time and effort? Yes, if you follow a few simple steps. 1. Be Very Clear on What You Want to Present. Presentations are only effective if there is a clear intention behind them. After all, the main reason that presentation slides only have one (or perhaps two) charts on them is so that your audience is focused on that specific aspect of your data. If you use Excel or dashboard software for analysis, you’ll likely have found many pieces of data that are useful for decision making. However, the skill here is to only present what your audience needs, and no more. 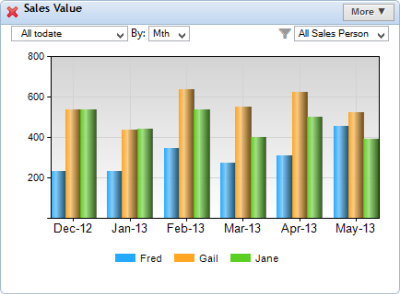 In a KPI dashboard, there are often 5 or more charts in the same place that can be compared to find answers. Putting all these into a presentation will only confuse viewers, so you must find the minimum amount of information needed for users to understand your message. You’ll very likely have analyzed your existing data in Excel or data management software to reach your conclusions; these are great for this purpose since you’ll have charts already made which show what you want to present. However, while these charts are great for analysis, they will likely have additional information which isn’t relevant to your presentation. Take a look at these two charts, both showing sales. The first is found in a dashboard, while the second was edited to be presentation-ready. This chart compares the performance of different sales people. 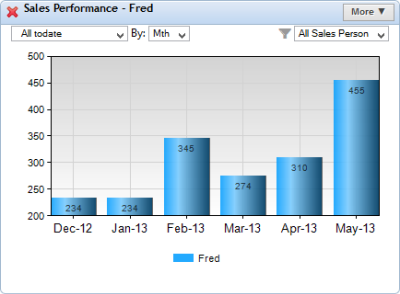 However, note Fred’s rising performance recently. a. Y-axis minimum value of 200, to emphasize the trend line. b. Numerical Values added to the columns. These changes make the chart incredibly simple to read, and were done in just a few seconds in Target Dashboard. Now that we have our presentation-ready chart, the final step is to have it make sense with the other information in your dashboard. As I mentioned before, a presentation may appear to be just a dashboard split into its individual charts. However, as we have just seen, a presentation’s charts focus on one point in the data, unlike many dashboard charts which display detailed KPIs for analysis. Since your presentation charts will contain much simplified data, it is very important that you give this data as much context as you can without cluttering up the presentation slide. There are a few ways you can do this. This is particularly useful if you’re giving your presentation in PowerPoint, as you can easily copy your presentation charts to a PowerPoint slide and add text around it. Remember though that you don’t want to add too much detail this way, as people will be focused on you during the presentation. Your chart only serves to help viewers absorb and retain what you tell them. If you have many important points that you want to raise in your presentation, its best to create as many presentation charts for them from your dashboard by repeating steps 1 and 2. This actually gives you an opportunity to give context to your charts by ordering them so that the information from a previous chart supports a subsequent one. For more information on creating great dashboards, presentations and reports, why not download our Dashboard Best Practice Guide for free now!